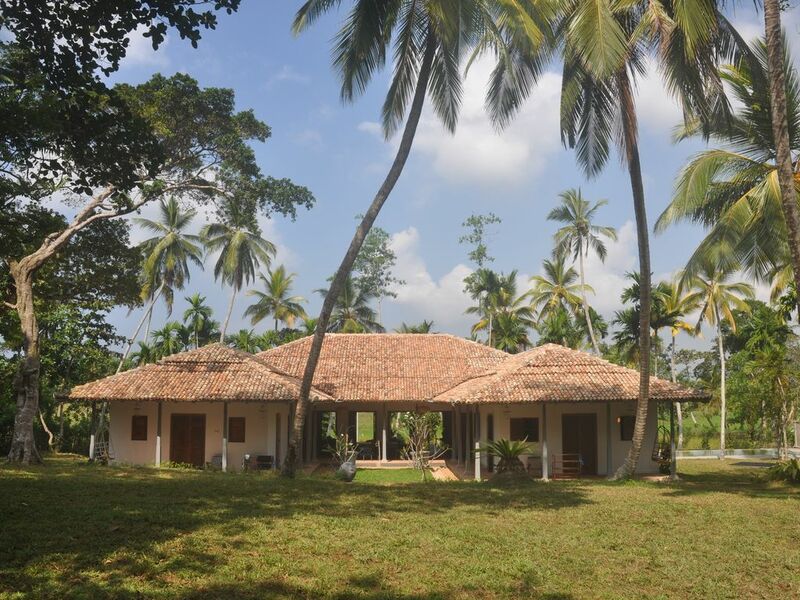 The Rice House is tucked away in a 1 acre plot of land next to a small village with a very authentic Sri Lankan Bakery. It overlooks the paddy fields and the only noises that you hear are the sounds of the birds (blue kingfishers, peacocks, etc), the water buffaloes, cows, the black monkeys that occasionally pay a visit to our jack fruit trees and the chanting of monks of the temple a kilometre away. The house has 4 separate bedrooms, each with its own private bathroom. Each bedroom has an antique king size bed and a daybed, that can be changed into an extra bed. All beds have mosquito nets. All rooms have overhead fans and air-conditioning and high wooden ceilings with king trusses. The floor consists of hand made terra cotta tiles that have been sealed by natural wax. Three of the four bed rooms are entered via the front court yard with frangipani trees and a covered verandah with a big dining table overlooking the garden. The fourth bed room is entered via the paddy field verandah (80 sqm big). The house is furnished with a mix of antique and design pieces. It oozes charm and personality. Each guest should feel at home. Young and old should therefore choose their spot where they feel the most comfortable, sink onto the big bean bag pillows in front of the television, sit on the two 3 meter design couches in the living room, cocoon in one of the 3 rattan hanging chairs or hanging wooden benches on the verandahs or just plunge onto the butterfly chairs; once you are seated in these, you do not want to get up. The 6 meter high-ceilinged (45 sqm) living room has a television and a lounge area with design couches, chairs and poufs. Children and adults can watch television as well as play some WII games. In the garden you will find an infinity pool alongside the paddy field with a terrace with sun beds. Soccer or cricket can be played on the lawn in the garden. We, Oscar and Marijke, grew up in the Netherlands. Although we still love to go back to Amsterdam now and then, we have not lived in Holland since 1996. For 10 years we lived in Italy, where our three children were born. After a few years in Stockholm, we moved to Singapore in 2008, a 3 hour flight away from Sri Lanka. More than 15 years ago we travelled to Sri Lanka for a holiday without any preparation. We even did not bring a lonely planet, at that time our travel bible, because it was a very last minute decision. Without any expectations we started our trip and found out that it became one of our best holidays ever. People were very, very friendly, the food was very tasty, the variety of the country really appealed to us (cultural triangle, tea plantations, beautiful beaches, etc.) and we loved the Dutch heritage buildings we saw during our trip. Years later we decided to bring our children to Sri Lanka and we again enjoyed it so much that we decided to contact some real estate agents during our trip. We spend a few days looking at heritage buildings in the province of Galle, because that was originally the idea, to renovate a heritage building. All the houses that we saw unfortunately were not well plotted on their piece of land or were very dark, difficult to enlarge, etc. So we decided to look for plots of land to build our own 'heritage building'. We immediately fell in love with a plot of land, overlooking paddy fields. That was 3 years ago and in the mean time we have built our house, integrating old building materials. We can see ourselves as retirees seated on the veranda and spending our time watching the many beautiful birds passing by. Until that time we would like the house to be used by people all over the world. It is a nice combination of being in the middle of the nature, away from it all, but close enough to the lively surroundings of Galle and Unawatuna. The house is fully staffed who will do their utmost to make your stay relaxed and unforgettable. Enjoy!! All the bedrooms have each their private bathroom. Each bathroom has an antique basin cabinet, a rain shower and hand shower. The Emerald bathroom is slightly bigger and therefore contains also a bathtub. All 4 bedrooms have an air-conditioning. Bed linen, duvets and at least two pillows a person are provided. Please let our staff know if you need more pillows for your convenience. The washing machine is located in the staff house. Laundry service available. A dryer is located in the staff house. Towels, including beach towels, are provided. The living room is 42 sq. m big. There is a television and a WII console with games. Two large couches sit easily 6 people besides the design chairs, poufs and 3 large bean bags. There are two dining areas. One dining table is located at the Paddy Field Verandah and sits 12 people. The other dining table is located on the Garden Court Yard Verandah and sits 8 to 10. We have a jam box that you can use. Any iPod, i phone, i-pad or other tablet can be attached wireless via bluetooth in order for you to play your favorite music. Ask Gayan to show you all the board games you can find in our old antique safe in the living room. Please ask Gayan for the badminton sets, the jeu de boules game and the cricket bad and ball you can use during your stay. I stayed at the Rice House from 19-24th December with my family of 13 people. We had the most incredible time there, and if you can believe it, it's more beautiful in real life than the photos! I booked about 3 months before we arrived, and the communication with the owner was efficient and clear from the start. The property hosts 12 people, but they accommodated one extra adult on a mattress on the floor as it was only for a few days, which we found perfectly acceptable for us. Gayan the houseboy/chef cooked us the most amazing meals that everyone was happy with - a difficult task considering we are a family of meat eaters, pescetarians, vegetarians and vegans! The surroundings are beautiful, tranquil and relaxing. We spent days enjoying all the exotic fruits offered for breakfast, playing in the infinity pool and spending time with each other. In the late afternoon we would head out to nearby beaches/towns. It's in a great location to visit lots of south and west coast places as day trips, such as Galle, Mirissa beach and Unawatuna to name a few. The house itself can be tricky to find, but the staff were on hand to direct our driver and met us on the main road. My only warning would be that the road leading up to the house is very narrow - we had a 29 seater Toyota coaster which struggled to fit, but it's less than a 5 minute walk from the main road to the property, which was fine for us. The rooms are kept to a high standard, and the staff were always on hand to help us. We can't wait to go back and stay again someday, it's honestly stunning! Nous avons passé une semaine de rêve avec 6 adultes et 3 enfants dans cette maison de 4 chambres avec une piscine à débordement qui possède tout le confort moderne, et mélange astucieusement la construction traditionnelle avec le confort moderne et possède une jolie décoration avec quelques objets design.La maison est ouverte sur l'extérieure avec une très grande véranda donnant sur une magnifique rizière et sur sa faune ( buffle, oiseaux, singes...) où sont pris les petits déjeuners et les excellents repas préparés par le personnel inclus dans la location. Cette maison est dans un environnement calme et à environ 25 minutes à pied de la mer ou 5 min en tuk tuk. The Rice house, as we named our house, is located not even 5 minutes from the beach. You can choose to go either in the direction of Matara to Weligama for surfing lessons and whale/dolphin watching tours during the months December till April (25 minutes by tuc tuc) and Mirissa bay for the lovely big stretch of beach, or in the direction of Galle, where you will find a lot of nice beach clubs along the Galle Matara road, such as Talpe beach club (5 to 10 minutes by tuk tuk), Era beach ( 10 minutes) and Vijaya beach club (15 minutes). Unawatuna bay (15 minutes) is flocked with a lot of restaurants and sun beds. It is a very vibrant beach, nice and very safe for younger children. Just 25 minutes away is the 17th-century Galle Fort, a must see!! Galle is a beautiful old colonial town where the mix of trendy restaurants and shops on one side and local life on the other side is still well balanced. Sri Lanka is renowned for its cultivation of high quality teas. It is the second biggest tea exporter of the world. Therefore you should visit a tea factory. Only 30 minutes from our house you will find Handunugoda Tea Estate. Here you will have the opportunity to visit the tea factory and learn how the white tea is plucked and made into one of the best teas in the world. You will also be able to taste the famous tea on the veranda of the main planters house while the plantation history is briefly explained. The climate of the Southern Province of Sri Lanka is very suitable for the growth of cinnamon. Enjoying a cinnamon infused lunch at a cinnamon plantation just 30 minutes from our house is another activity well worthwhile. Enjoy a bike ride tour with Idle Bikes that will bring you to paddy valleys with a half away coconut stop in a shaded ambalamba set in a beautiful garden. Most of all you should take the time to relax at our house. Watch the water buffaloes and the hundreds of birds passing by while taking a dip in the pool or just sipping your tea at the veranda. Ask Gayan, our chef, to prepare you lunch and/or dinner. Just sit back, relax and enjoy the house and the surroundings as much as we always do!! The above rates are reflecting the rental fee per night for the whole villa.